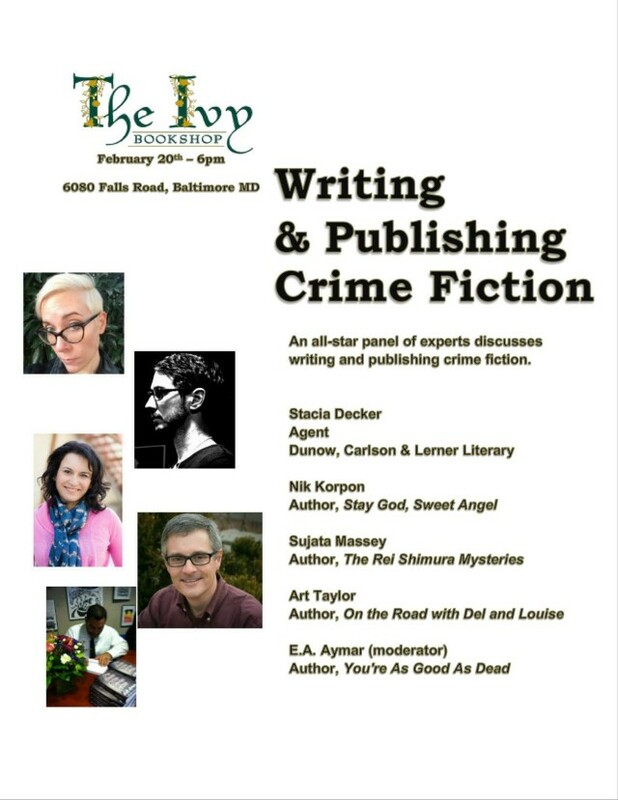 This Saturday, February 20, four crime fiction writers and one of the genre’s leading agents will take part in a writing and publishing panel at Baltimore’s Ivy Bookshop. The bookstore is located at 6080 Falls Road in Baltimore, Maryland, and the program begins at 6 p.m. Here are bios on the list of participants—and pleased to be included on the program myself! E.A. Aymar is the author of I’ll Sleep When You’re Dead and You’re As Good As Dead, both from Black Opal Books. He also writes a monthly column for the Washington Independent Review of Books, and is the Managing Editor of The Thrill Begins (for the International Thriller Writers). His short fiction and non-fiction have appeared in a number of top crime fiction publications. He holds a Masters in Literature and lives outside of Washington, D.C.
Stacia Decker has been agenting since 2009. Previously, she worked at the Donald Maass Literary Agency and, as an editor, at Harcourt and Otto Penzler Books. She began her career as an intern and then editorial assistant at Farrar, Straus & Giroux after earning an MFA in nonfiction writing from Columbia University and an AB in Government and English from Georgetown University. She represents high-concept literary and speculative fiction, commercial thrillers, crime/mystery fiction and sci-fi fantasy. She is partial to strong voices, fast-paced plotting and near-future or cross-genre elements. Nik Korpon is the author of several books, including Soul Standard, coming in 2016, and Stay God, Sweet Angel. His short fiction can be found in the collections Bar Scars; Hoods, Hot Rods, and Hellcats; Dark Corners; Crime Factory and The New Black. He lives in Baltimore. Sujata Massey was born in England to parents from India and Germany and grew up mostly in St. Paul, Minnesota. She holds a BA in Writing Seminars from Johns Hopkins University and started her working life as a features reporter for the Baltimore Evening Sun. After leaving the newspaper, she moved to Japan, where she studied Japanese, taught English and began writing her first novel, The Salaryman’s Wife. This novel became the first of many in the Rei Shimura mystery series, which has won Agatha and Macavity awards and been nominated for the Edgar, Anthony and Mary Higgins Clark awards. She’s currently based near Washington, D.C.
Art Taylor has won two Agatha Awards, the Anthony Award, the Macavity Award and three consecutive Derringer Awards for his short fiction. His stories have appeared frequently in Ellery Queen’s Mystery Magazine, and his novel in stories On the Road With Del & Louise was published last fall by Henery Press. He is an associate professor of English at George Mason University, and he contributes frequently to The Washington Post, the Washington Independent Review of Books and Mystery Scene Magazine.